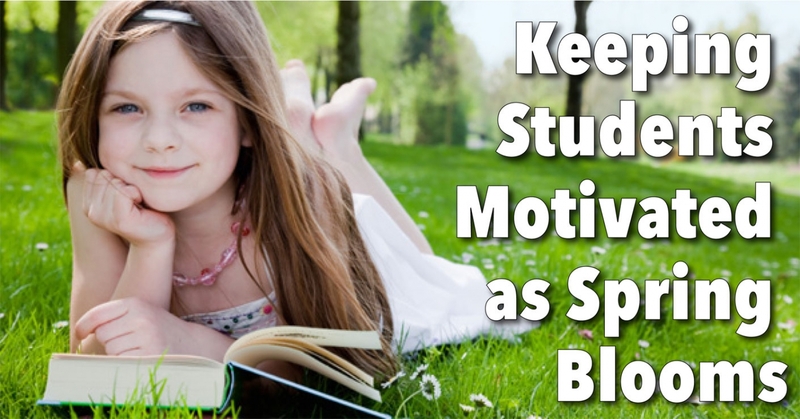 Keeping little scholars motivated as spring blooms. For young students, the academic year seems like a long time, and their ability to stay focused could diminish during the spring months. In all fairness, playing outside and shedding layers the cold weather requires does seem appealing after a long winter. Just because the temperature rises outside doesn’t mean the learning has to stop. Ashley Leeds, elementary education coordinator at Thinking Caps Tutoring, suggests some great ways to keep the momentum going in the last leg of the school year. Keep the general work routine the same, but change the activities. For example, start homework at the same time as always, but incorporate fun ways of completing assignments. Move afterschool work outdoors or toss a ball outside during breaks. Update materials and replace notebooks and folders that are falling apart. Consider this an academic spring cleaning. Have your child adorn book covers with a warm season theme. Decorating school supplies makes each subject more vibrant. Students are more inclined to complete work if they are excited about using new notebooks or colored pens. Make homework a family activity. Parents can use the time to read the paper or catch up on e-mails while kids complete school assignments. If the whole family is sitting together, kids don’t feel like they are missing out on other activities. Enjoy a board game or dinner after kids complete their work. Incorporate delightful activities into studying, like creating learning games that engage students. Spelling may be practiced with a round of hangman. Math may be integrated into dinner time or car travel conversations. The timeless enjoyment of Red Light, Green Light gets kids moving around as they work through any homework assignment. Creativity helps students to break up monotonous tasks. Set family goals and monitor progress. Working toward a goal aids students to stay on track. Often, by the last months of school, students have lost some motivation because they have forgotten the excitement the first weeks of school yield, such as learning new things and setting goals for themselves. If you and your kin did set goals at the beginning of the year, revisit those ambitions. Discuss how far your children have come and what they hope to accomplish in the remainder of the academic year. If you didn’t write down goals, do so now. Have kids think about all the great things they learned this year and chat about what’s upcoming. As the academic term winds down, help your kids stay excited and focused on the remaining days of class. Renew the energy banks with fresh supplies and a family conversation about the year’s accomplishments thus far. Remind your clan that learning doesn’t stop once the class bell rings and discover new activities and information outdoors.